← Chalk, Cheese, and a Connected Community of Learners. A former student is not finding writing easy at present. However, he is an amazing young advocate for gifted education, and for many other good causes, so he wrote the words above, and he was pretty sure they wouldn’t be good enough. I have asked his permission to share them anyway, because I feel that these words are a profound metaphor for dual exceptionality. Twice exceptional (2e) students seldom experience the classroom as a place of relevance, acceptance or belonging. Twice exceptional students see what they have to offer as being as out of place as birdsong in a classroom. However, what twice exceptional students do have to offer will always be something we have no hesitation in admiring in an appropriate environment. Who among us does not enjoy birdsong outdoors? The tui is such an apt choice for the metaphor. The sound of the word (which is just like 2e, for overseas readers) makes it work at first, but we can dig deeper. In the video above, if you watch the tui singing, you will probably notice its beak moving silently at times. It is still singing! It can sing notes which most of us cannot appreciate, because they are beyond our range. This reminds me that we must gather data from many sources to appreciate just what our twice exceptional students can do. Our usual range of observations is likely to let us down. It is worth noting that this tui’s family can hear all the notes he sings. A tui is also an excellent mimic. They have been known to copy referees’ whistles, telephones, the sounds of power tools, and the songs of other birds. While this has great entertainment value, we probably love tui best of all when they are just being tui, and singing tui songs. Do we send this same message to our 2e students, or do we require them to mimic other students in our classrooms, while failing to value their true selves? Have you ever watched tui fly? The straight line, which we are told the crow flies, holds little interest for them. When tui fly for fun, they are iridescent, aerobatic speed machines. They take risks, wheel and dive, and experience flight to the fullest. Do we stand beside our 2e students as they aspire to lives which embody this kind of vibrant fullness? It’s high time we did. Credits: The tui image is the work of a former student who chooses not be named. The embedded video is by Tony Palmer. 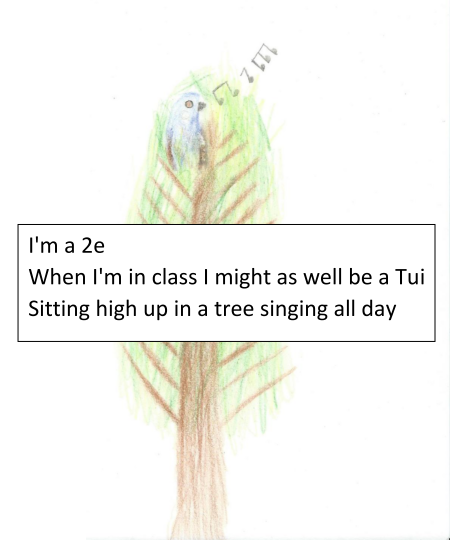 This entry was posted in education, gifted, New Zealand and tagged #2ekids, #nzgaw, assessment, blog tour, child's viewpoint, children's art, children's writing, gifted education. Bookmark the permalink. What a beautiful expression of realizing oneself! It belies a deep understanding of what twice-exceptional really is and also shows us a glimpse into these beautiful minds; too often a rich, untapped resource in our world!